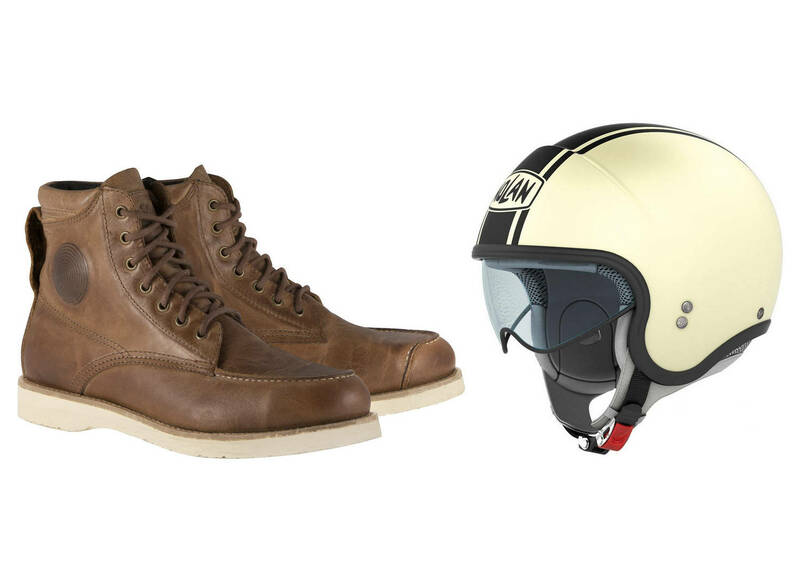 Motorcycle Gear Takes a Decidedly Retro Turn – Are You In? The Italian giant Alpinestars jumped into the retro craze earlier this year with its Oscar line. This is a signal, among others, that retro-styled motorcycle gear has really caught on, and is now big business. The yearning for authenticity (the definition of which is explored in the Alpinestars video below) is partially behind this trend, but ultimately style is the driving force. Take a look at the following two videos – the first by Alpinestars, and the second by helmet manufacturer Nolan, and tell us what you think of retro-style gear and whether you might be buying some soon. Naked Bike Bragging Rights: Is Ducati About to Release a Streetfighter 1299? Retro gear… Spare me. I ride a ’71 BSA Lightning as transportation. That’s retro enough. I actually wrench on the bike and do everything but the bottom end. That’s REALLY retro these days. The only retro gear I’ll wear is my Vanson jacket, and it’s armored up. I have not seen any retro gear yet that has the same level of protection as the modern stuff, particularly when it comes to helmets and gloves. I wear the full kit no matter how hot it is, jacket, full face helmet, pants with armor, boots, all of it. This poser silliness just slays me. The kiddies need to get real. I got a degree in health information management and one of my assignments was to study TBI or traumatic brain injury. I was shocked and enlightened at the same time with what I discovered. I think that many riders are not aware of just how fragile our skulls are (NFL is certainly finding out the hard way – no pun intended) and the damage that can be inflicted in even a small accident, where your head my hit the sheet metal on a car or if you bounce your head of the pavement. The brain sits in a pool of cerebral fluid in the skull attached at the bottom by the spinal cord. Kind of like a balloon if you held it by the stem with your fingers. And when there is a sudden stop, your brain being in fluid still moves, and hits the skull interior in the direction of the impact. What is most damaging to our brains is what follows the impact and that is called edema, or build up of fluid. It’s this excess fluid that eventually kills brain tissue. I also found out that most ERs, if they think there is any possibility you have any trauma to your brain will not use local anesthetics. That means if you were unfortunate enough to have broken your arm and leg too, they will reset them WITHOUT local painkillers. This is because most anesthetics raise blood pressure and that is the last thing they want happening in the brain so the lesser of two evils is to go without the anesthetics. Ouch indeed. I think I’ll keep wearing my helmet and I’ll probably be able to hear the unfortunate rider screaming in the ER a block away with it on. You are right and I don’t think a single post here debates the fact that it’s a good idea to wear safety gear, particularly a helmet. In this country (USA) the average age of a motorcyclist is 49 (I didn’t make that up check the statistics). I don’t think its news to anyone that the majority of bikes sold in the USA are Harley’s, Victories, Indians or Japanese V twin Harley clones (again I didn’t make that up, check the statistics). If you have seen any rallies, gatherings or groups of riders for that matter of this style of bike, I think it would be safe to say full coverage helmet use by this group would be considerably less than 1 %, ANY helmet use by this group (unless mandated by state law) would be less than 10% and that is probably being very generous. The peer pressure in THAT group NOT to wear safety gear is overwhelming. A rider may show up in a helmet once, but when he looks around at how his fellow riders are dressed, he won’t wear the helmet to the next ride. Guaranteed. No amount of preaching to that group is going to make them don full face helmets, armored jackets, armored pants, motorcycle specific boots or armored gloves. Preaching to the 18-25 year old squids is also useless. They are going to wear their full face helmets and probably some gloves but will wear T shirts jeans and gym shoes if they are lucky. So preaching to the vast majority of motorcyclists is a waste of time. The people that are left, a tiny minority of cyclists in this country are probably going to choose wearing gear anyway, because a certain percentage always will. Those that want to. Sometimes I will wear it all, but sometimes I will wear an open face helmet ,leather jacket, jeans and work boots depending on temperature, length of ride etc and NO amount of preaching is going to make me dress any differently. I am an adult (65, starting my 50th year of street motorcycling) and know the risks associated with riding a motorcycle, as I imagine most adult motorcyclists do. Preaching is a waste of time. Leading by example in your peer group will be the most effective tool towards getting some people to wear gear. No matter what you do, or say, some will wear it, some won’t. As both a current, and prior, owner of Alpinestars gear I’ll say that they are *highly* overrated. As for retro gear? IF, and that’s a HUGE “if”, it works as well as more modern designs then I am certainly willing to add them to my shopping lists. If not – No, goodbye, good riddance, GET OUT. Not only no, but hell no. The retro craze whether bikes, cars or accessories, points to a weakness in current, non retro design. Many folk are waxing about the “golden days”. Todays styles lack something, something big. Todays modern style is unnatural, it has little flow, and seems to be searching for something. Thus the thrill of retro. I ride a 07 Guzzi Breva 1100. Its styling is post modern, somewhat weird, Italian. It is not ugly, but something got screwed up along the way. It will never be viewed as beautiful, and that is what the retro craze in trying to capture, the natural beauty of man and machine. I wear what I have or works. I wore out the originals of most of the stuff these kinds of guys sell. OK, I get retro but save your money. Trust me Gore-Tex works better than canvas in the rain as but one example. Now if you are a poser well then fine…..which means the HD stores will be loaded. The Alpinestars stuff – at least the jackets have CE-approved shoulder and elbow armor, and provisions for a back protector. So they’re not totally useless. Sure are spendy, though. The rest of the Oscar line….. nah, I’ll pass. That Nolan N21 helmet: nope, nope, nope. I have never and will never wear anything but a full-face helmet.